Crossroads introduced winter Collection 2013-14 of outfit for men and women. 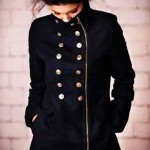 It consists of western wear clothes for men and women both. Jeans, shirts, sweaters, jackets, scarves, tops etc are included in this collection. These clothes are not really fancy and are suitable for casual wear. Color combination is much more important in fashion designing which is being tackled by Crossroads especially in winter Men and women Collection. Lets have a look at Crossroads fall winter collection 2013/2014 for women and men. CrossRoads is a Pakistani western wear brand popular in youngsters launched in 2002. Since the very beginning of this brand they have worked hard to reach the expectations of their target customers i.e Pakistani youth. Crossroads offers Ready to Wear, Casual Wear, Street Wear fashion and western trendy dresses for girls, boys and men, women. Crossroads having 45 outlets all over Pakistan. CrossRoad’s always introduced new and different style outfits, no doubt that each outfit is eye-catching and likeable. Sharp and bright colors only use for young generation boys and girls, because today’s young generation mostly choose to wear high contrast bright colors. These soft and comfortable outfits are available at CrossRoad’s stores/outlets.